Thanks to A~ for her research help. The following news summary stems from an incident “related to narcotics,” as explained in a subsequent article. Barb had a concealed knife. Maybe Lind’s funny-bone was still bothering him that day, two or three years later, when Ron bumped him and he almost shot Diles. Like a fine wine, this case keeps getting better. I have a similar incident in my book re: Lind, but jealousy is the motive. I may release my book serially, old school, one chapter at a time here on the blog, and then later on as a full-size book. I’m not doing this for the money (which btw, new samples from it were posted by me this morning). Wow, Butterfly knew how to work a knife. Great stuff John. Maybe Barbara wasn’t the sweet innocent butterfly I perceived her to be? 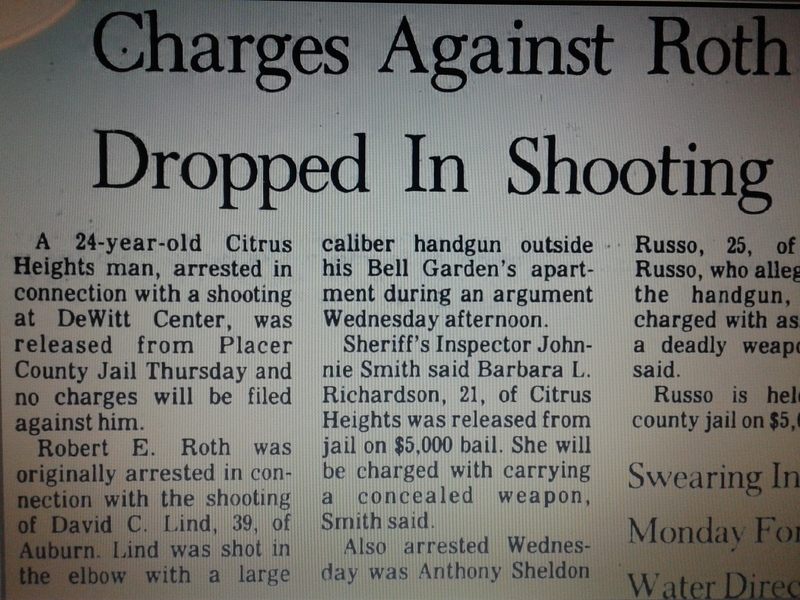 It was Butterfly Richardson who actually tried to cut Diles throat during the Nash robbery and Lind blamed Launius as to cover for Barb, lol. Unless Lind had some type of reconstructive surgery… yeah, he was probably grazed or they mis identifyied the caliber? If it were Ronnie who was shot in the elbow, the bullet would have bounced off of him, out of fear. Launius does seem to have that Chuck Norris underworld mystique.